Nobody really thought that peace and prosperity would last all that long in the kingdom, and just as we suspected, those white knights fled to protect their necks when the going got rough. Now, dragons, the undead, and legions of ghouls might be enough to send most regular soldiers fleeing for the hills, but you're not like other soldiers, are ya? Nope, you're a dark knight, and you were born for this. So, make sure you have the right armor to match your style by picking up this Dark Medieval Knight costume! A seriously cool armor set that riffs on classic knightly uniforms of lore, you're going to be ready for one heckuva battle when you suit up in these threads! 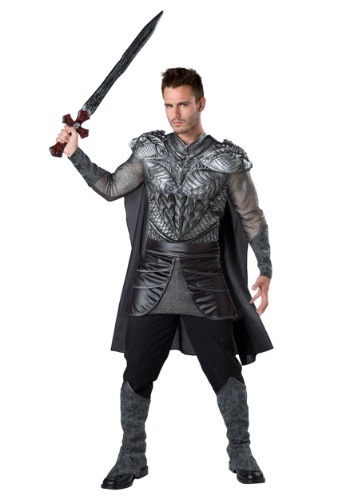 Styled as a tunic top with cape and armor pieces, this costume will transform you into a medieval warrior, no problem. The long sleeved tunic has printed armor effect details on the chest, and features knit mesh sleeves for a chain-mail like appearance. But the molded chest armor and shoulder caps are what makes this costume stand out. With textured details that evoke the mystery of mysterious creatures, we think you're going to have an easy time fighting for the forces of good OR evil. Faux suede gauntlets and boot covers along with an apron belt complete the costume set. Just use your own pants and pick up a mighty sword prop to complete the theme (sold separately). When you have this dark and mysterious costume, you'll be ready to battle with whatever foes you feel like!